A number of countries, including China and the UK, are moving fast to accelerate sustainable finance and position themselves as leaders in this economic transition. Canada has the right ingredients and capacity to be a leading “shaper”, rather than a “taker”, in this changing global marketplace. Our sustainable finance market is not currently growing at the pace needed to do so, but there seems to be a strong appetite to improve that situation. The report outlines 6 “Foundational Elements” that they see as essential to underpin increased investment in sustainable activities. It warns that without these elements, Canada’s mainstream financial system will struggle to align to low-carbon and climate-resilient priorities, missing the opportunities inherent to clean growth. Clarity on climate and carbon policy, such as on carbon pricing (a key measure) and longer-term capital investment priorities, would allow for better informed financial decision making and help spur innovation. Reliable information, preferably from a centralized source(s), on climate data and related financial analysis. Effective climate-related financial disclosures, which would require identifying practical steps that need to be taken for more consistent and comparable information on climate-related financial risks and opportunities. Improving clarity and education for those holding a legal or ethical relationship of trust with investors (fiduciary and legal duties). Strengthening the climate-related expertise of the financial ecosystem including lawyers, accountants, auditors, rating agencies and others. Effective and consistent financial regulation, including greater cross-jurisdictional collaboration and policy consistency (both domestically and internationally). These policy and finance elements would help reduce barriers and mobilize greater private sector capital towards low carbon solutions. The report also highlights some of the most important financial and market opportunities to reduce emissions and accelerate clean growth across Canada’s economy. Mechanisms to help aggregate, warehouse and/or securitize retrofit projects for buildings to increase energy efficiency and resiliency. Mechanisms to crowd-in private sector capital toward sustainable infrastructure, as the foundation for low carbon competitiveness. Removing barriers and accelerating solutions for commercializing and scaling up clean technology innovation, a critical driver of growth across the economy. Providing targeted support for expanding clean electricity-related infrastructure, such as smart grids, energy storage and transmission line interconnections across Canada. Boosting innovation in the oil and gas sector to reduce emissions, lower costs and strengthen competitiveness by positioning Canada as one of the cleanest, most efficient producers in a changing global energy market. Incorporating climate change considerations into asset management and investment consulting, including the use of benchmarks. Expanding the impact and reach of ‘green’ bonds and loans (towards “transition-linked bonds”) to support investment and innovation for the low carbon transition in all sectors (beyond traditional ‘green’ projects), such as by linking the cost-of-capital to environmental performance. 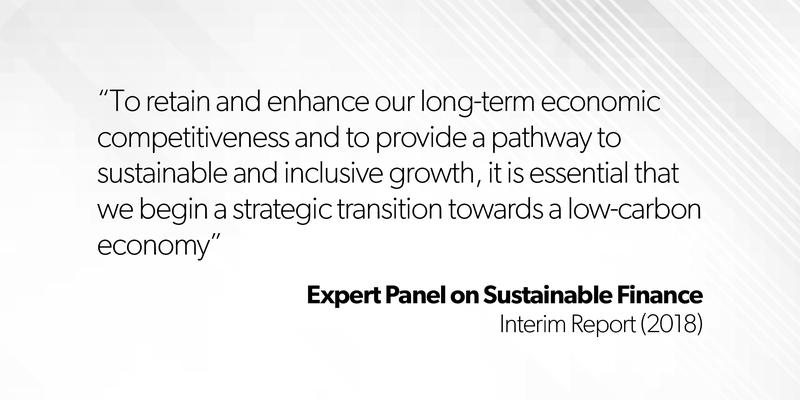 The Expert Panel on Sustainable Finance was appointed by Canada to provide advice drawn from broad consultations on how to help channel investment towards relatively lower carbon and more climate-resilient assets, technologies, infrastructure and business processes. The report also discusses the status of sustainable finance in Canada including progress on issues such as climate-related risk disclosure and green-bond issuances, as well as potential barriers to cleaner investment flows such as poor information and articulation of low-carbon pathways or uninformed risk expectations. The report notes that the entire financial community has a role to play including institutional investors, property and casualty insurers and reinsurers, banks, retail asset managers, and other investors and firms. Moreover, growing sustainable finance will require effective collaboration across jurisdictions and sectors. The panel members are: Tiff Macklem, the Dean of the University of Toronto’s Rotman School of Management and former senior deputy governor of the Bank of Canada; Andy Chisholm, a member of the board of directors of the Royal Bank of Canada and previously Goldman Sachs & Co, in New York; Kim Thomassin, an Executive Vice-President with the Caisse de dépôt et placement du Québec; and Barbara Zvan, the Chief Risk & Strategy Officer for the Ontario Teachers’ Pension Plan. This Interim Report also outlines a number of questions that will guide further consultation over the fall. The final report, to be delivered in the spring of 2019, will include practical and actionable recommendations that both the public and private sector can consider to help gear up the financial sector for climate change.